It has been too long since I've posted on here, so I'm glad to be back blogging again. With the end of the school year approaching, my life has been pretty chaotic, in a good way. Here's a fun spring outfit for this week. This is what I consider to be a very simple, yet chic outfit. Black, white, and a pop of pink. As you can already see, I love pink! And as quoted by Madame Chanel herself, "A girl should be two things: classy & fabulous." 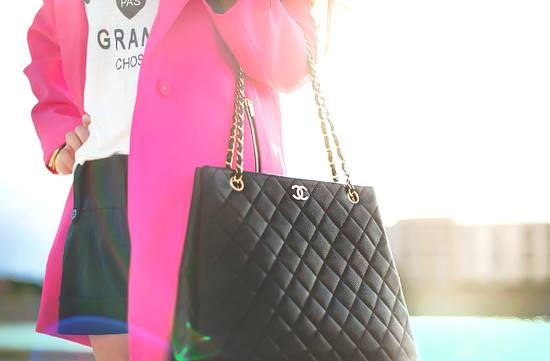 To be honest, it's hard to feel anything but, classy and fabulous carrying a Chanel. Love the pink blazer and the shoes! Great look! That pink!! Love it! The whole outfit is perfect! Love those shoes! I have a similar pair!